Yes, we have off-street parking freely available within the premises boundary. We are a 5 minute walk from the station. We are a 5 minute walk, in the opposite direction from station, to the town centre. Check-in is to suit your arrival time. If your room is not quite ready, you are welcome to leave your bags, pick up your key and start exploring St. Albans. You are given a key to both your room and the front door and are able to access your room at any time during the day, as long as we have the opportunity to service it in the morning. Yes, all of our rooms are; all have spa showers and one has a spa bath. Yes, unless it has been excluded upon request. Yes, but we do suggest advance notice for gluten/dairy free/vegan ingredients. Yes, every room has a 2100 kw hairdryer and an iron/ironing board. Yes, password protected and if you find the signal weak, please let us know and we will ‘boot’ it accordingly. 10.30 am, but you are welcome to leave your luggage/car to enjoy some fresh air before your flight/journey. We would like as much notice as you would like to receive in terms of any cancellation but we do understand life ‘happens’! However, by the offer and acceptance of a reservation we have entered a formal contract so respectfully suggest that 72 hours notice of any cancellation/modification/curtailment is fair to all parties. After this point, we would endeavour to re-let the room but would expect to be compensated for any shortfall in income. 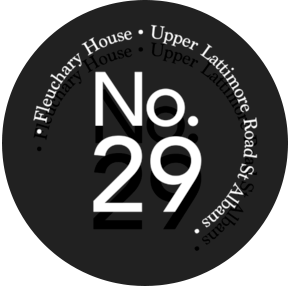 Fleuchary House @ No. 29 is strictly non-smoking in accordance with the Health Act 2006. Whilst vaping is not covered under this act, we do also preclude this practice within the property. For those who do partake, an ashtray is provided in the seated area under the cover of our porch.